Enter to win a new Kitchen with the DIY network’s Wishin’ for a Kitchen sweepstakes! Are you wishing for a new kitchen this holiday season? HGTV wants to give you the chance to win a new kitchen! 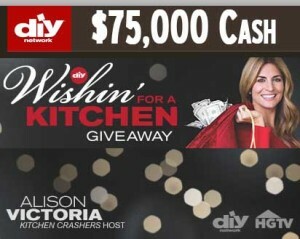 The Wishin’ For a Kitchen Giveaway could see you winning $75,000 cash from DIYNetwork.com and HGTV.com! This is a daily sweepstakes, so enter once a day on each website (2 entries!). Do not miss out on a free kitchen and enter before the closing date of December 20th, 2013, for your chance to win. The Wishin’ for a Kitchen giveaway is sponsored by Sponsored by the RTA kitchen cabinets and Vitamix. The lucky grand prize winner will receive $75,000 in cash! In addition to the 2 online entries daily you can also enter by mail as often as you like! Mail in entries must be postmarked by December 20th (received by December 30th), (1 entry per envelope of course!). So if you have a bunch of stamps you want to use up then go for it! 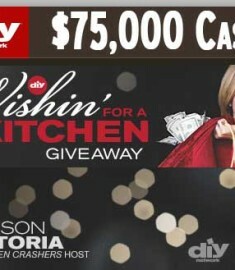 Visit diynetwork.com/wishin and HGTV.com/wishin for your online entries or use the link below! Just imagine cooking up some gourmet meals in your new kitchen or baking with the kids. I love a great HGTV sweepstakes and this is up there with the best of them. With free money and $75,000 no less! You could have the kitchen of your dreams and have some free cash left over to take the family on vacation! So enter to win a new Kitchen today! Win the Christmas sweepstakes. would like to surprise my wife Kim, for 20 years of sacrifice, while serving in the US Navy. We bought a new house in April, the kitchen is old and outdated, the rest of the house is perfect, we can’t afford to update for awhile. I would lve to win a new kitchen! Wishin for a Kitchen in Oregon! I’ve been wishin’ for a new kitchen since we got married and moved in nearly 13 years ago. It has a galley kitchen type layout, but then opens up to a bay window with dining and open area that is just unused space. I don’t know what to do with it…we want to add some island seating and match the kitchen to the rest of the house…Please, Santa, I’d really love a new kitchen this year!! I’m wishing for a new kitchen for my daughter a single mom and teacher. Her kitchen is around 48 hers old and dreary. She’s working on her master’s degree in education and has so many school loans to pay back that she will never be able to afford a new kitchen. Since she spends so much time in her kitchen working on classroom prep material, I know it would give her a great lift in spirit to have her kitchen renovated. I have never won anything in my life but as an expectant mom to be it would be a dream come true to have the Kitchen of my dreams as I love to coook for my family. My kitchen is so small that two people can’t be in there at the same time. It’s out of date and needs to be completely remodeled. I would love to receive a new kitchen for Christmas as I’m retiring in the next two years and a new one is not in the budget. Thanks so much for the opportunity to win a new kitchen! Kids are grown and gone and with all my volunteer work I just don’t have time, but would love a fabulous kitchen remodel……..
Wishing a new kitchen for my parents. My parents are always hosting family get togethers and need an upgrade on their kitchen. I am addicted to your TV channel. I even have my husband hooked. Our kitchen is VERY old.. We sit there and drool over the amazing transformations made on the HGTV shows!! Love the open concept and the before and after is unbelievable!! Hoping to win!! Wishing for a new kitchen, Happy Holidays everyone!! Would love a new kitchen mine is over 40 years old needs up dating badly. Our kitchen is 1970’s. The rest of the house has been redone. Due to financial issues we can not afford to do the kitchen. Please help! We would love to have our Kitchen redone, our Home is a 1960 house and we have been in it since 1999, our Kitchen has had very little work done to it and would love to have a New Kitchen. We Need Your Help, Help us with our Kitchen Please !!!!! Thank you so much for your time and it opportunity to enter. help them with their expenses, so my wish for a new kitchen was never achieved. The kitchen is the original kitchen from 1975, so it is very outdated. This would truly be a blessing. My Husband built our whole house and when wanting to move from the basement upstairs we did it as reasonable as possible. So got some cabinets from work they were pulling out of Lunchroom just to have some. Been upstairs 5 years now with same cabinets. Oh by the way we have no top cabinets. Actually I kind of like it this way. Sure would be nice to have a nice kitchen. Our kitchen is 14’X18′ Love the size. Dear Santa sure would love a NEW kitchen. Would love to “gift” this to some older friends with mobility issues. Regardless, it will be a terrific prize for whomever wins! We purchased our house and made more than it appraised for so there was no money to remodel. My wonderful husband built my cabinets and they are great but my kitchen is designed from the 60’s and I would love a new lay out and updated kitchen. Santa please bring me a wonderful new kitchen. I would like to update my kitchen it looks like it needs a renovation. I recently purchased my first home and I really confused in regards to ideas for the perfect kitchen. We desperately need a new kitchen. Ours is unfinished. Nothing works. It’s totally dated. We love DIY! my son and daughter inlaw , kichen was built in 1950 and it i s pink.and she is a great cook . baby 3 is coming in july . My husbands daddy died in 1980.His mother could not afford the house they were buying so we decided to pay all the funeral expenses and move in with her to keep from losing the house. The kitchen is so small two people cant get in there,its like a small galley kitchen. We have nine people living here at the moment . I would love to have a bigger place to be able to cook in.My husband and I have always took in family members who are on the down and out. I could really use the money to do a lot of much needed improvements. Good luck to all the contestants, but I would love to win. My husband and I would love a new kitchen. Prior to our moving in, the original kitchen in our home was poorly updated. Horrible color and design choices were made and need to be corrected. A new kitchen would be a wonderful reason to celebrate. Thank you and Happy Holidays. Our house is 23 yrs old and has a basic functional kitchen. It would be awesome to remove the wall between the den and kitchen to create an open floor plan. Would really be nice to have more room when family comes to visit and would make wife very happy. This is something good for people that can’t afford to do it themself!! I need a new kitchen and hope I win! Hi I found out about the sweepstakes a little late, but I entered every day on HGTV and DIY. I would so much love to win. My husband went through cancer treatment and I went through a very rough surgery this past year. Our kitchen is in need of total repair. We live in a 57 year old Florida home. We can’t afford to do what we want nor do we have the energy to do. Keeping my fingers and toes crossed. would love to remodel kitchen to make it easier for my 92 year old mother . I live here also ( my house ) and could use the help also haven’t got the physical ability or tools to do job . been diabetic for 53 years and can’t stay on my feet and legs long enough to build anything or to cook. would love to make it nicer for both of us. house is close to 70 years old, kitchen is over 40 years old. its a very nice house with newer upgrades except kitchen. thank you and have a great day!